Thinking about installing a standing desk for your own office space? Take a look at some of the reasons why you should. Working in an office is less physically strenuous than many other careers. You’re far less likely to wear out your knees working as a receptionist than a longshoreman, and the risk of injury is fairly low, barring a freak microwave accident in the kitchen. Most of us spend our days seated at a desk, making calls or typing. We’re safe, comfortable, and secure. But this lifestyle may not be as healthy as it seems at first glance. Since computer-centered cubicle culture became the norm in the 1990’s, the negative effects of sitting at a computer for eight or more hours a day have become apparent. There’s carpal tunnel syndrome, eyestrain, and other repetitive stress injuries, caused by doing the same physical activity for hours at a time. Even though we may be accomplishing all different sorts of tasks via the computer, to the body, it all feels like the same thing. And on top of those potential problems, there’s a risk of obesity and other issues associated with the sedentary lifestyle of sitting for hours at a time. Innovative engineers have created ergonomic keyboards, differently lit screens, and other solutions to office-related health problems. But these don’t remedy the problems associated with extended sitting – a recent study found Americans sit for nearly six hours a day on average. So, the latest trend aims to get workers off their butts entirely at the office. It’s called a standing desk, and it’s becoming popular for people who want to work at a desk without remaining seated for long stretches of time. 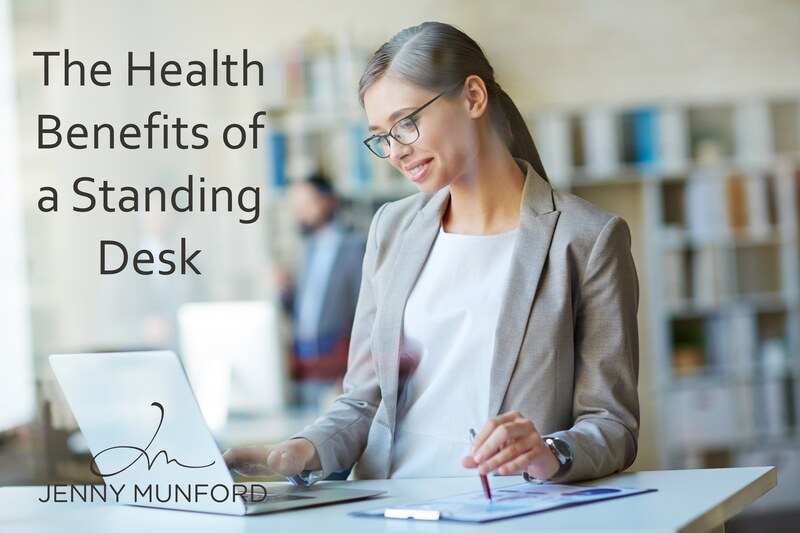 Standing desks are designed to allow you to perform the same functions you would normally do while sitting, meaning they’re set higher than normal desks; experts recommend finding an optimal height that allows you to maintain good posture without straining your neck. Some standing desks even offer the ability to transition between sitting and standing, coming equipped with motors or crank systems to raise or lower them. Others are designed for artists, with adjustable slants for optimal drawing or painting. Standing burns 50 calories more per hour than sitting does. That doesn’t sound like much, but the real trick is that by getting you on your feet, a standing desk encourages you to move around the office more. A Mayo clinic study increased the caloric intake of a group of office workers, asking them not to alter their habits. The workers that gained weight sat 2.25 hours more per day than their counterparts, who were more likely to move around the office, whether stretching their legs or going to the bathroom. A standing desk gets you out of the habit of being glued to your chair, thus putting you at much less risk of obesity. Standing desks have benefits for posture, as well. When seated at a computer, it can be tempting to slouch forward or lean on your desk as you focus on the task at hand, but over long periods of time, this can really damage your back. A properly adjusted standing desk, which places the computer just above your resting eye level, solves this problem. And it has the added benefit of keeping you alert: you’re less likely to be distracted or drift off into a daydream if your head is held upright. Plus, standing improves your core strength. Spending hours a day at a desk is a fact of life for many of us, but that doesn’t mean we need to live out our days as slouchy office drones. A standing desk can reduce your risk of obesity, improve your posture, and help keep you sharp, alert, and creative. We can all stand for that. Jenny Munford coaches and trains a new rising tribe of women entrepreneurs worldwide. She helps them step into their greatness, achieve exponential company growth and create the life of their dreams. Jenny has over 34 years of business knowledge that she shares with others, from her own experience of building three companies from ground up, creating hundreds of jobs and going where there is no beaten path. Jenny has received dozens of international awards for entrepreneurship, business and marketing. In 2011, she was awarded Canada’s Women Entrepreneur of the Year - a very prestigious award of which she is quite proud. Jenny has climbed the mountaintop of success, yet she also knows firsthand what it’s like to fall down into the darkest sinkhole after having to close her 10 year old company. She now combines those seemingly disparate experiences and dedicates herself to helping other entrepreneurs succeed.